Most days going out to the mailbox is pretty boring, pizza coupons and internet service ads. But not this week, first came a package from Molly at Birdie Blue. I won her Cath Kidston giveaway!! 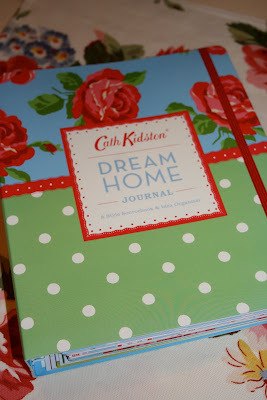 You know how I LOVE Cath Kidston! Love my Dream Home Journal! Love my Menu and Shopping List! Thank you Molly! Be sure to visit her blog, Birdie Blue, I know you will absolutely love it like I do. She has such a great eye for color and design. You won't be disappointed. As if my package from Molly wasn't enough, my Fresh Vintage from Fig Tree Quilts arrived. With it came a free cell phone case pattern. Oh, what a happy day! I also wanted to answer a couple of questions that have been popping up lately. First, I've had some inquiry as to the lavender water I use to iron with. At one of the local barn sales I attend, a woman makes this and I always get some when I'm there. I believe it is a tiny amount of lavender oil mixed with water. It does not stain the fabric but gives it the most wonderful smell. If we have all that ironing to do, why not enjoy the process? Secondly, I have shown the cooking lavender as well. That is lavender designed specifically for cooking, without any oils. I use that to make lavender shortbread. It's wonderful! what a cool prize and absolutely perfect for you to win! congrats! WOW! What a great day at the mailbox! I am so happy that you won Molly's give away. What could be more perfect for you than Cath!?! Fun! I used the lavender Ironing Spray on Sherries quilt, and both Sherrie and Allie noticed that calming, pretty smell. I make my own lavender spray - just googled up a recipe, but it included a dab of witch hazel. I always seemed to smell the hazel, so I'm going to leave it out next time. Thanks for the tip. Renee, it's such fun to see the pretty things that arrived in your mailbox this week. I've always considered the mailbox to be a real place of ministry ... such an opportunity for providing encouragement and sweet surprises. I used to do that a lot but have gotten away from it in recent years. Your posting nudges me to be more mindful of those little things. I hope you will have a beautiful weekend. Hugs from my heart to yours! This is my first visit to your site and I have enjoyed my visit. I picked up the little cell phone pattern a while back but have not gotten to it yet. Have fun with all your goodies. You lucky duck! I love Cath Kidston, I always wonder why there is nothing similar to her fabrics available here, I would buy them in a flash!